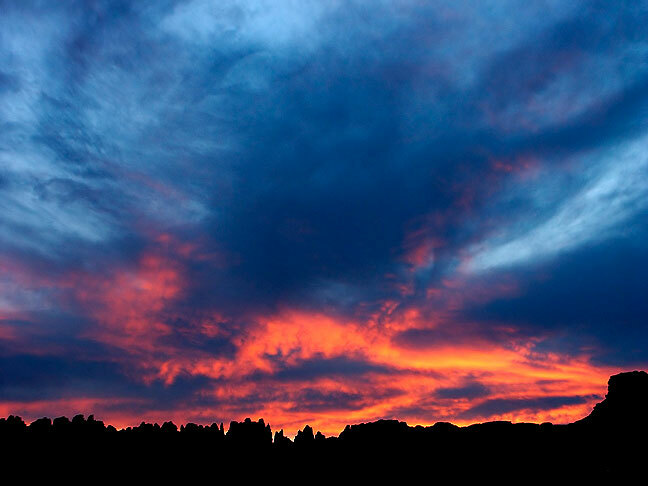 The sky glows fiery after sunset at the Needles district, Canyonlands National Park, Utah. The sun rises over route 666 in northwestern New Mexico. This was my first trip to southern Utah, one I wanted to make for years. With David Martin, who hiked with me at Chaco a year earlier, and Jamie Harrel, who had never been hiking in the desert, we set out on November 2, 2002. I initially thought we might camp somewhere along Interstate 40 in New Mexico, but we didn’t make very good time, and it was dark by the time we reached Tucumcari, so we ended up driving through to a Super 8 Motel in Gallup, New Mexico. 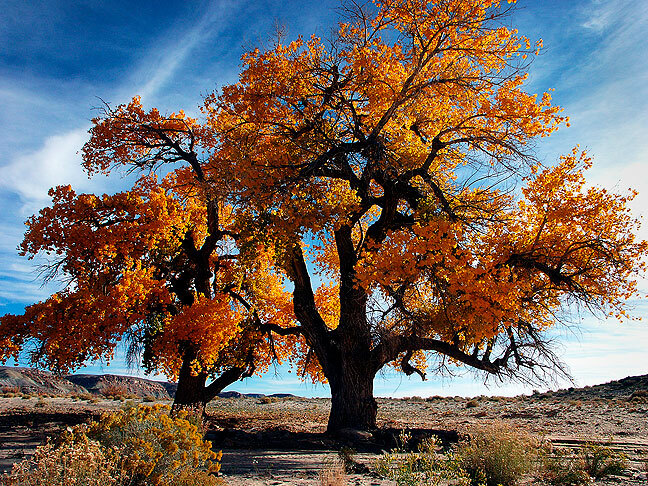 We found this handsome cottonwood in a dry wash near Four Corners. 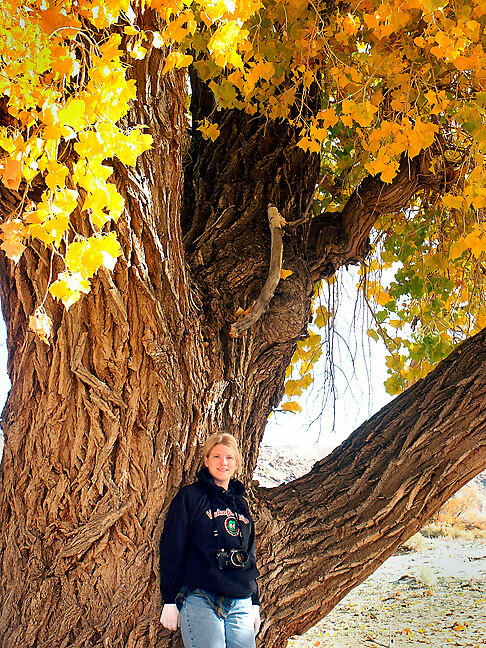 Jamie poses with a beautiful Cottonwood in a riverbed near Four Corners. We got up early and drove from Gallup through Shiprock, New Mexico, past Barber Peak, then through Four Corners, where we stopped and make some touristy photos of each other standing in four states at once. Just north of the four corners monument was a wash with a handsome yellow cottonwood, which I wanted to photograph, and where Jamie wanted to collect a sample of sand. 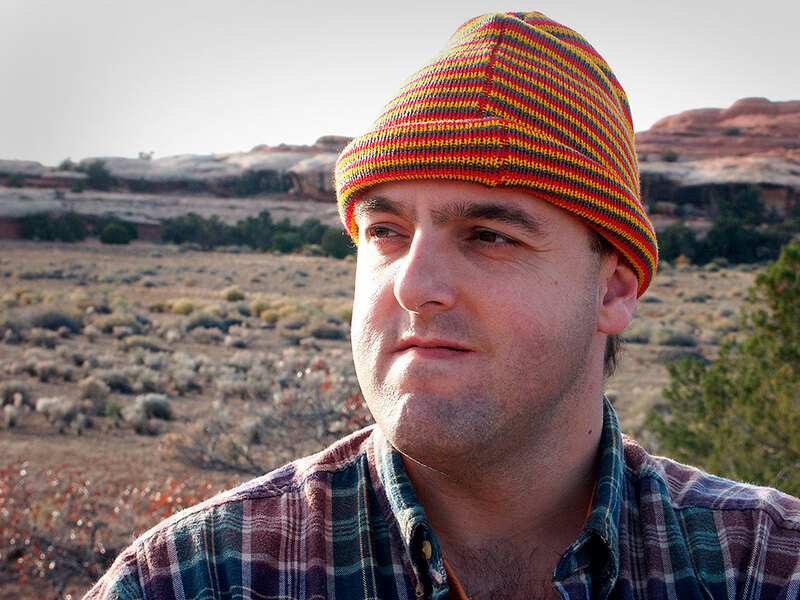 It takes a pretty cold morning to get me to wear my camp coat, which it was in this image with Jamie at Four Corners Monument, where we stopped on our way to Canyonlands. 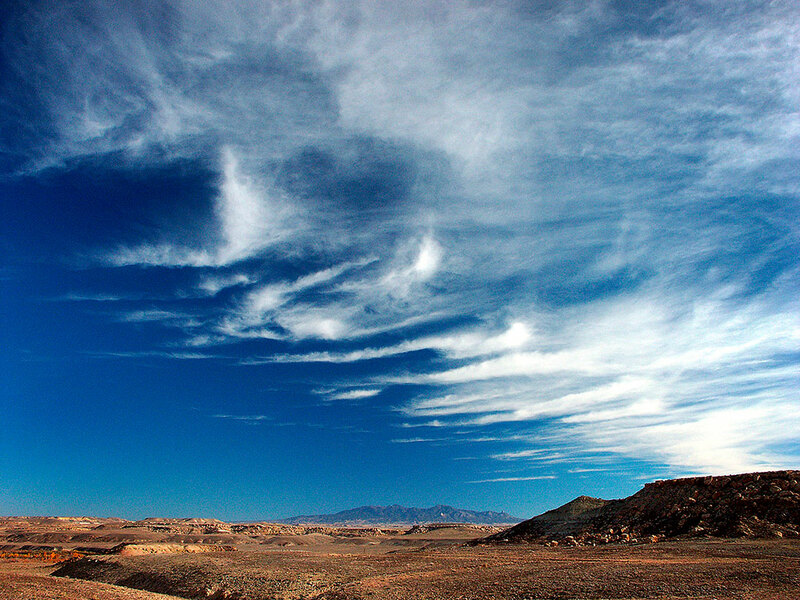 A beautiful, cold November sky greeted us at Four Corners Monument. 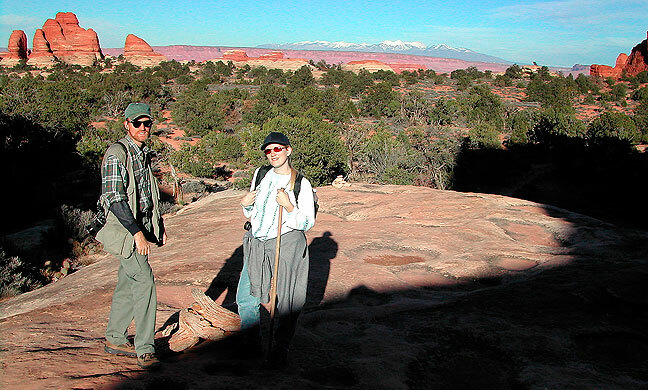 David and Jamie look over the trail near the Squaw Flat campground at Canyonlands. We arrived at the Needles District of Canyonlands National Park in southeastern Utah at about 2 pm. After setting up camp, we hiked the short Squaw Flat trail. We enjoyed a cold and silent night in the Squaw Flat Campground. As we had hoped there was no rain, few people, and absolutely fantastically beautiful skies and scenery. 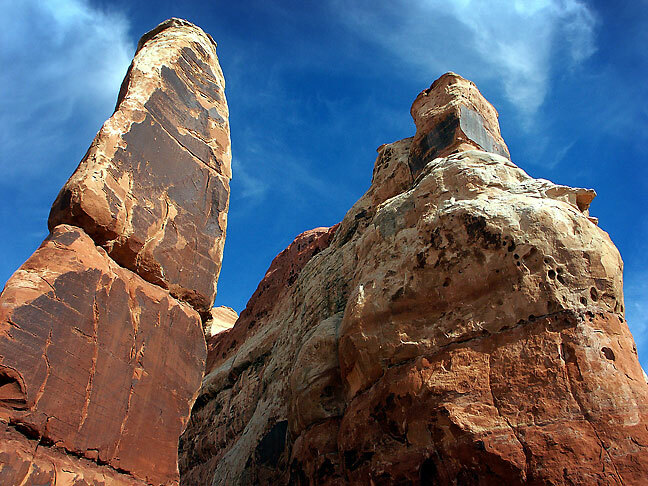 This Cedar Mesa sandstone formation stands above the Squaw Flat Campground in the Needles District. 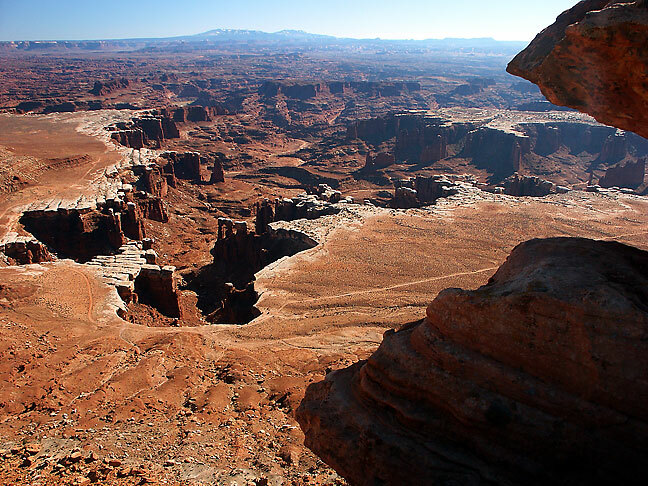 of Canyonlands National Park. 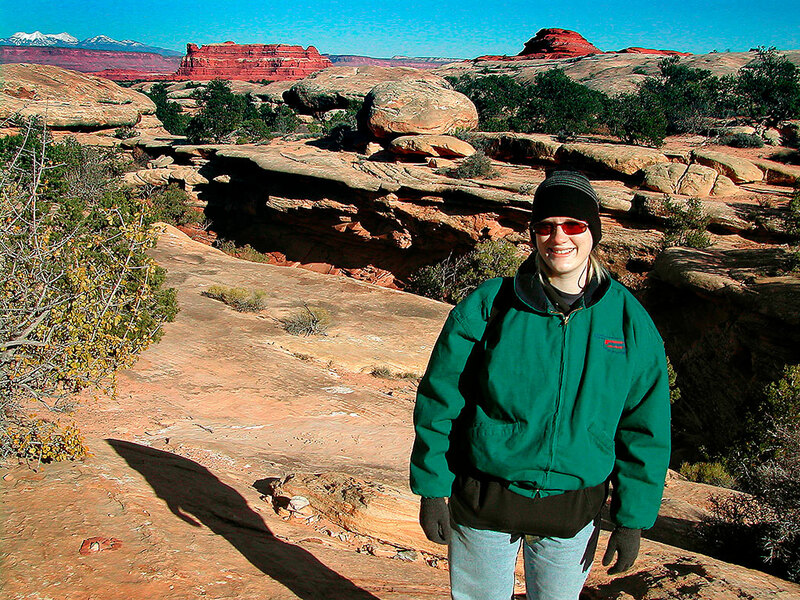 Jamie smiles as we explore the area around the Squaw Flat Campground at Canyonlands. David looks contemplative as he, Jamie and I explore the area south of Squaw Flat. Sixshooter Peak and Wooden Shoe Arch are visible from near the Squaw Flat campground. Wisps of clouds swirl in the breeze above the Squaw Flat Campground at dusk. We huddled together in our tent. Jamie was very cold as she slept in a borrowed sleeping bag between David and me; it was apparently a kid’s bag and was very thin and didn’t keep her warm. David woke up every couple of hours because he was too warm and took off a sweater or sweatshirt. Every time he woke up after that, he discovered that Jamie had put it on. At some point during the night, David and Jamie say I sat upright and said, “Sand animals made of sand! No one ever gets that joke!” They say I then went back to sleep. 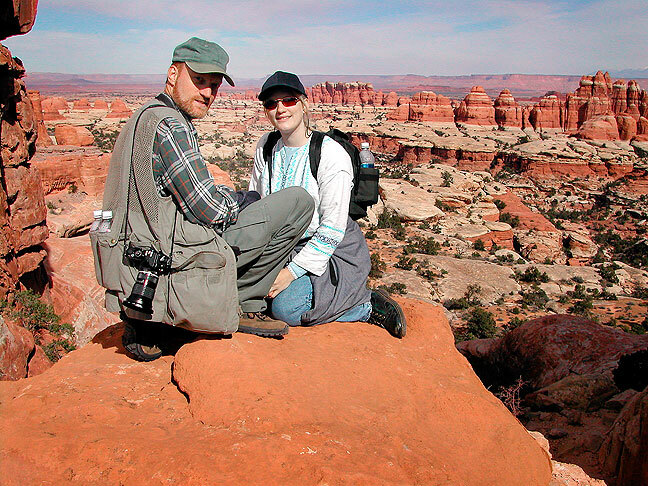 Jamie and I pose for a photo in the heart of Canyonlands, Chesler Park. 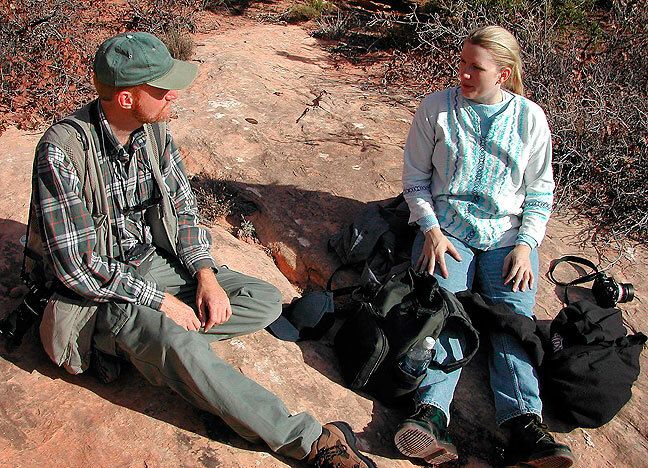 Jamie and I rest on the Chesler Park trail at Canyonlands. 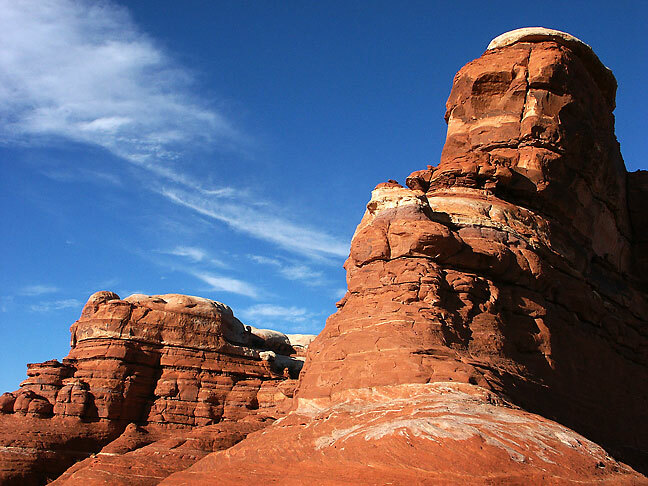 We hiked the Chesler Park trail in the Needles District of Canyonlands, hiking for almost all the daylight hours. We had a great time. Everything was beautiful; the light, the trails, the canyons, the sky. We totaled about 11 miles round trip. 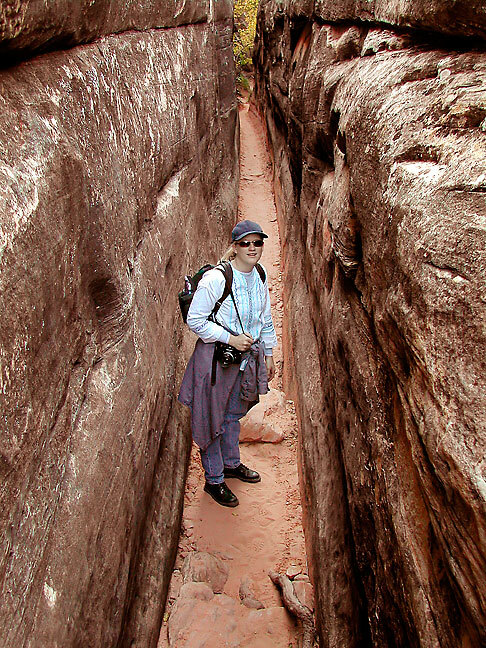 Jamie makes her way down “the crack,” a narrow passage on the way to Chesler Park at Canyonlands. 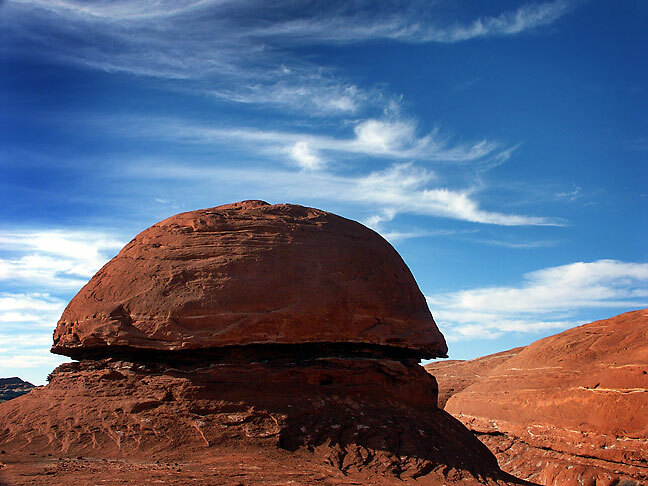 A mushroom-sharped rocks is set against a deep blue sky on the trail Canyonlands. 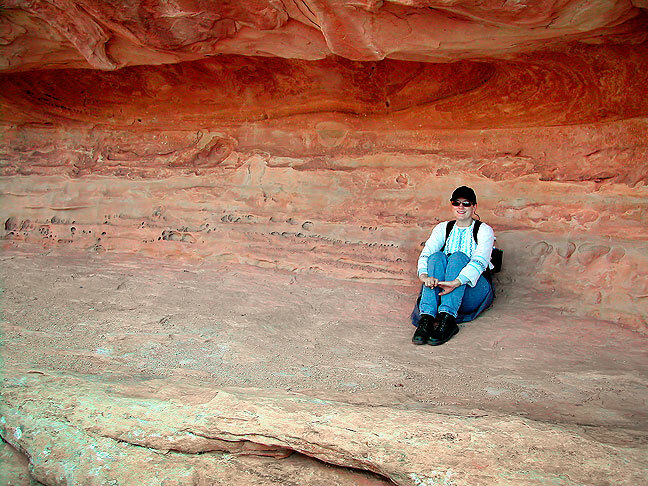 Jamie poses in an alcove on the Chesler Park trail at Canyonlands. 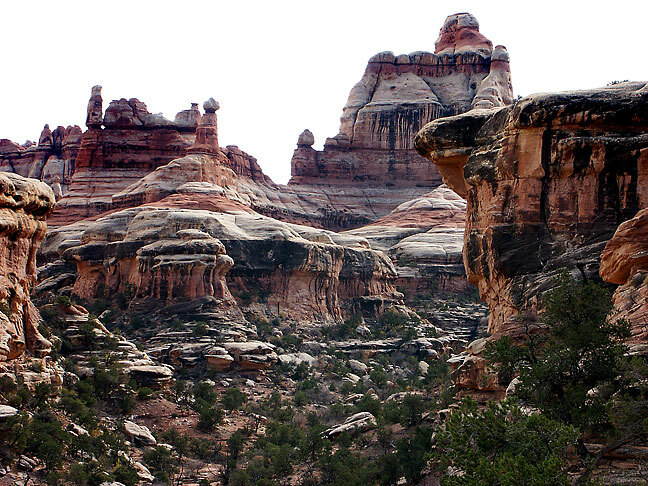 Cedar Mesa sandstone spires create a beautiful landscape along the Chesler Park Trail at Canyonlands. 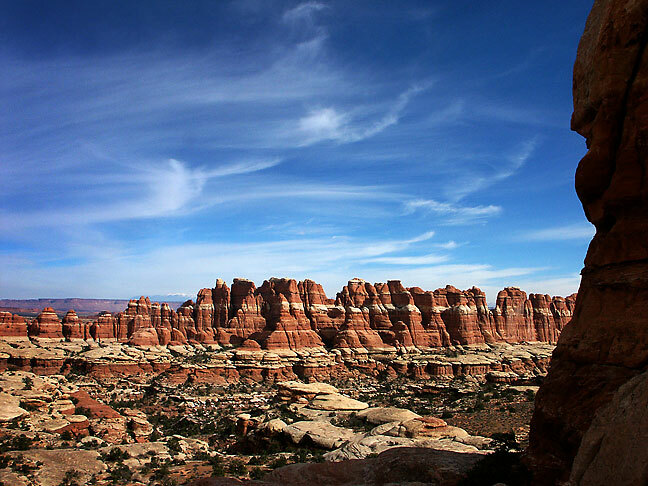 Chesler Park trail; in my opinion, one of the best trails in the American southwest. 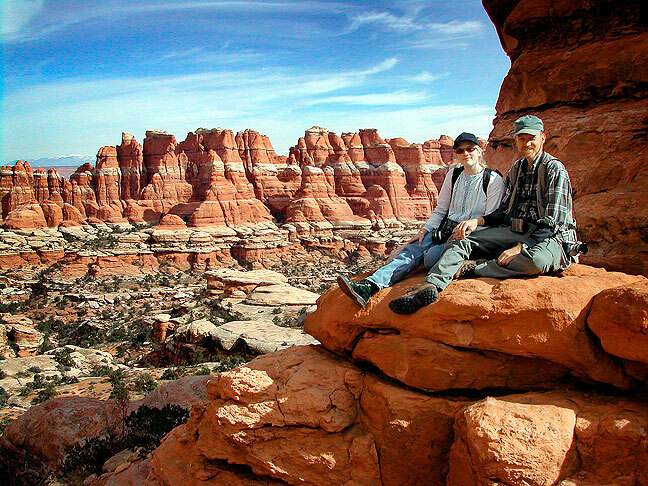 David and Jamie look east from the Chesler Park Trail toward Elephant Canyon. 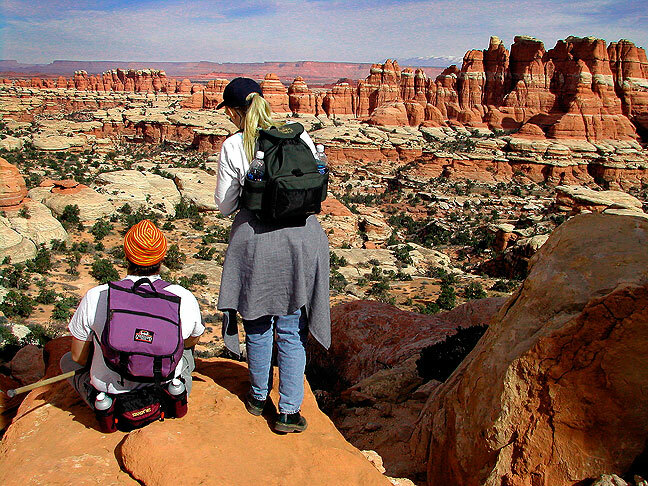 Jamie and I rest at the Elephant Canyon Overlook on the Chesler Park trail in the Needles District at Canyonlands. 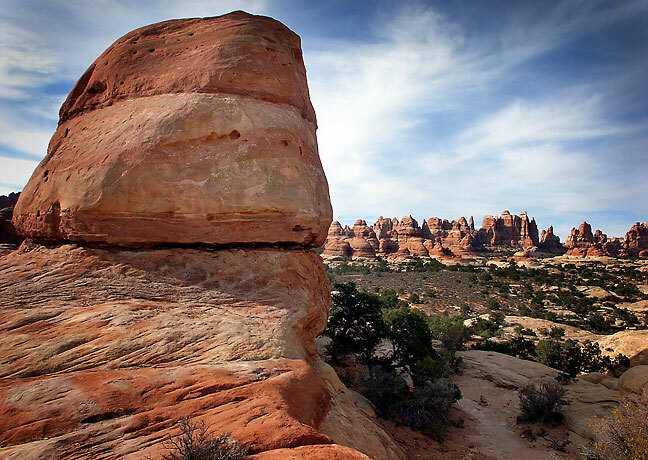 Cedar Mesa sandstone “needles” stand in Chesler Park, deep in the heart of the Needles district. 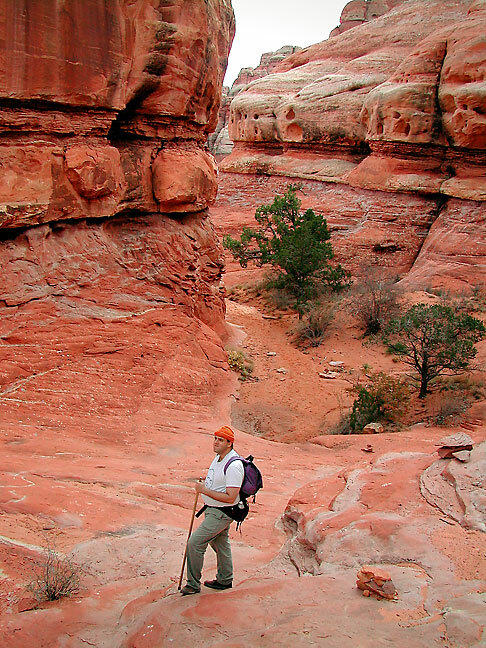 David pauses for a moment as we make our way down from Chesler Park to Elephant Canyon in the Needles District at Canyonlands. Steep walls adorned with desert varnish lead down into Elephant Canyon in the Needles district. 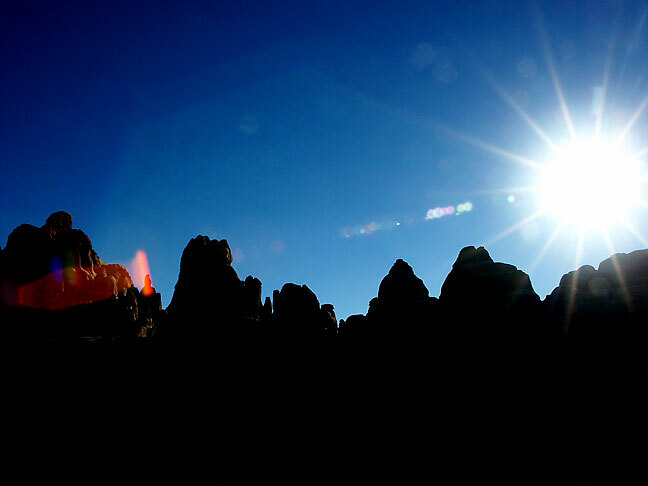 Brilliant late-afternoon sun shines through pinnacles near the Chesler Park trail head. Almost home: Jamie and I stop to pose for a photo as we approach the Squaw Flat Campground after spending the day on the Chesler Park trail at Canyonlands. This view looks east from the Chesler Park trail, down on the Needles of Elephant Canyon at Canyonlands. 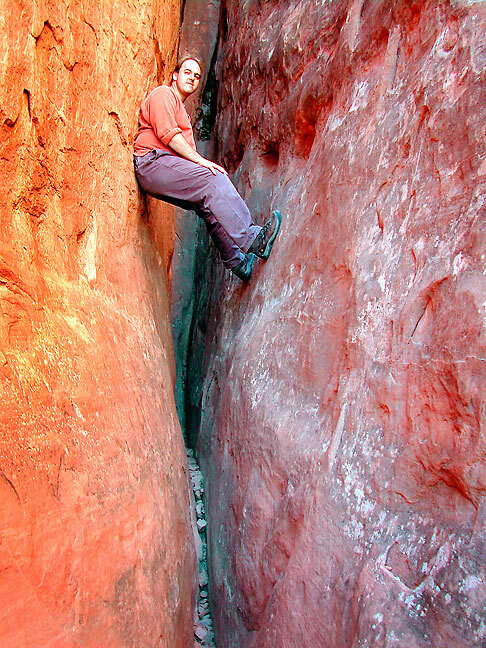 David chimneys a short way up a crack at Skyline Arch in Arches National Park. Because Jamie was so cold during the night before, we decided to stay in Moab. The light and sky continued to be perfect. 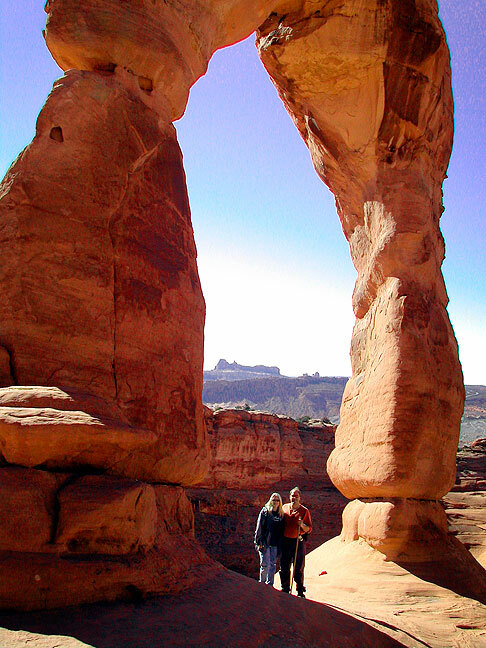 We hiked to Delicate Arch in Arches National Park. Jamie’s knees were really hurting her, and at one point she thought she might not make it, but when we finally topped that last ridge and the arch with the snow-capped La Sals in the background, she realized it was worth it. 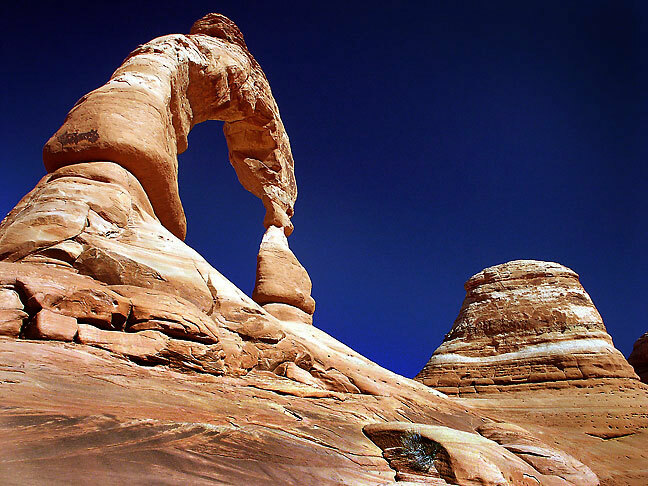 Delicate Arch is a signature formation of the American southwest at Arches National Park. 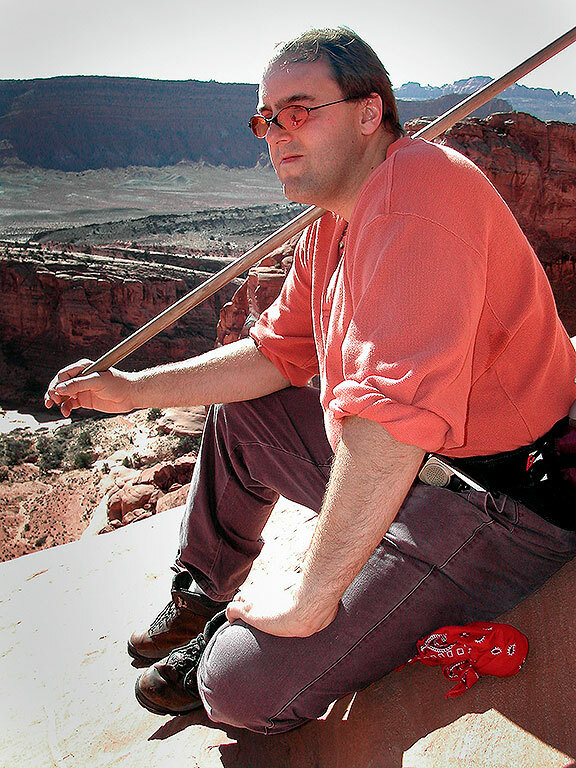 David sits under Delicate Arch at Arches National Park. 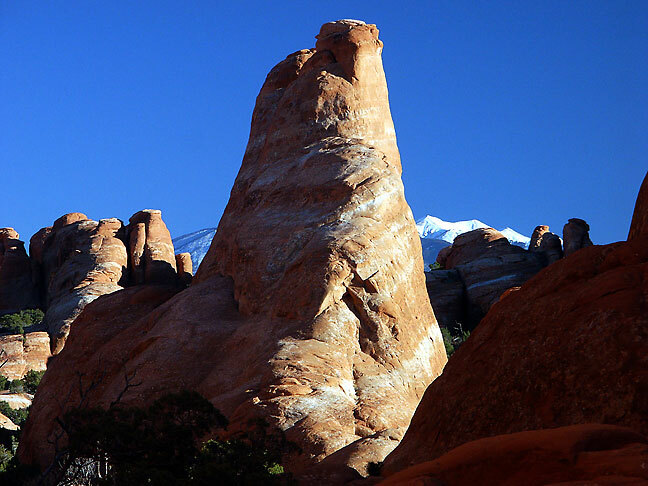 There is a handsome slickrock prominence to the north of Delicate Arch. 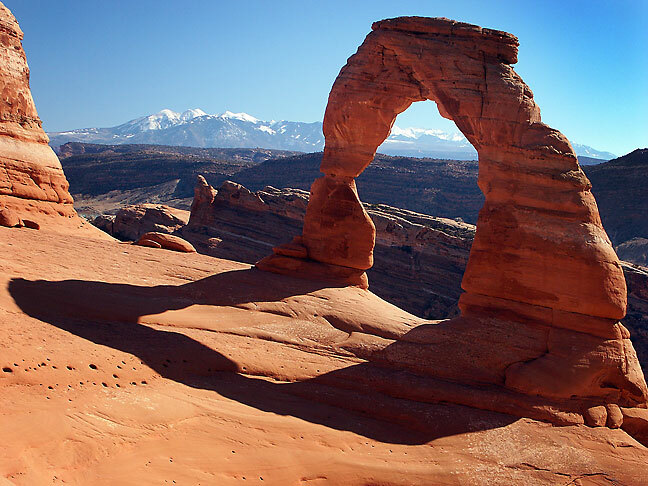 This view is from below Delicate Arch to the south; a few steps farther is a 300-foot sheer cliff. 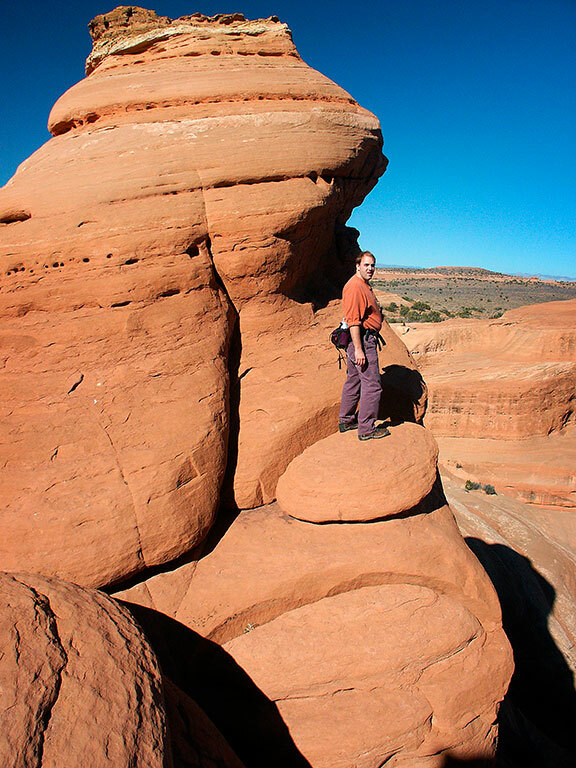 David explores the fins above Delicate Arch. Jamie decided to map in the sunshine at Delicate Arch. 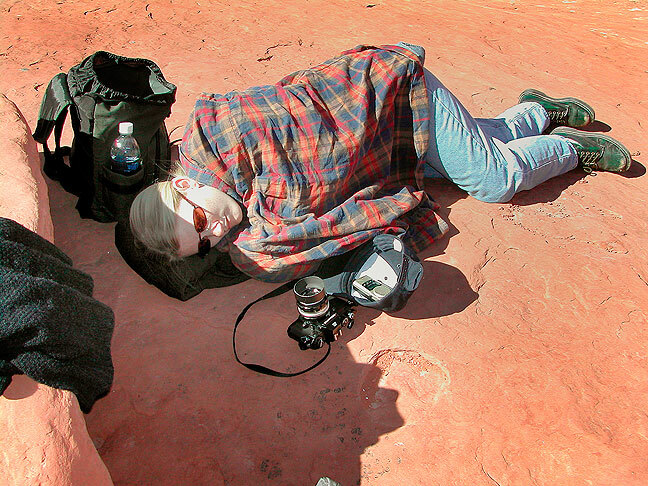 Jamie took a nap next to a boulder not far from Delicate Arch while David and I explored, including hiking down into a deep sandstone bowl below the ridge. Jamie and David pose under Delicate Arch. 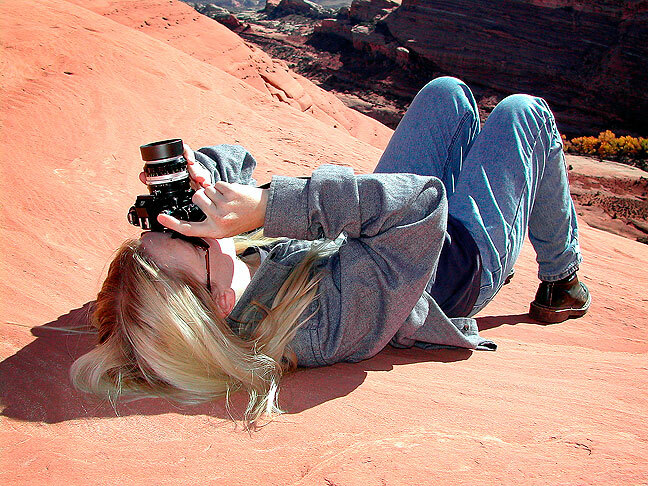 Jamie uses my Nikkormat to photograph Delicate Arch. 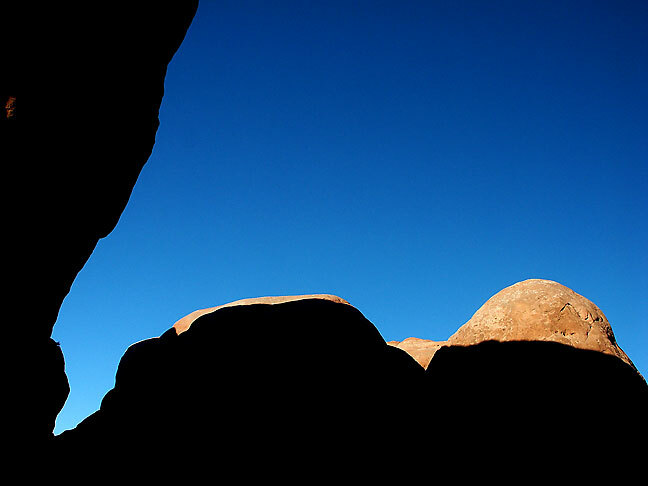 We saw several other excellent spots under a cerulean sky, and wished we could spend three weeks in the canyons. 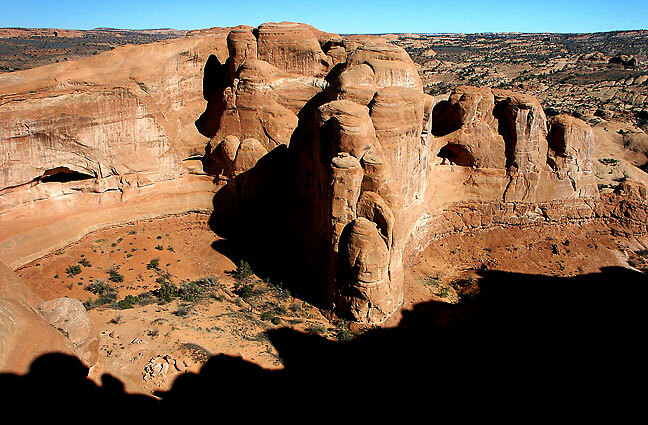 After Delicate Arch, we hiked around in The Windows and The Garden of Eden. The November skies were clear and deep blue. 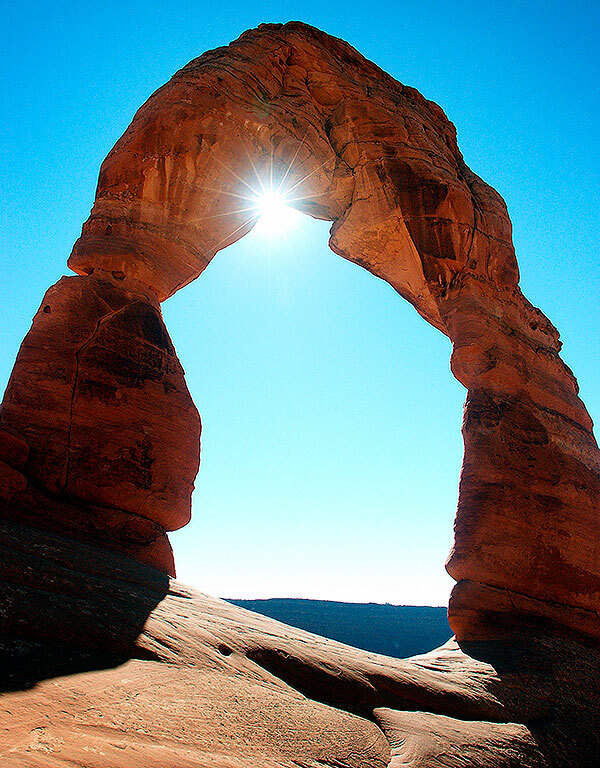 Beautiful autumn sun shines through the opening of Delicate Arch, viewed from the sandstone “bowl” below it. 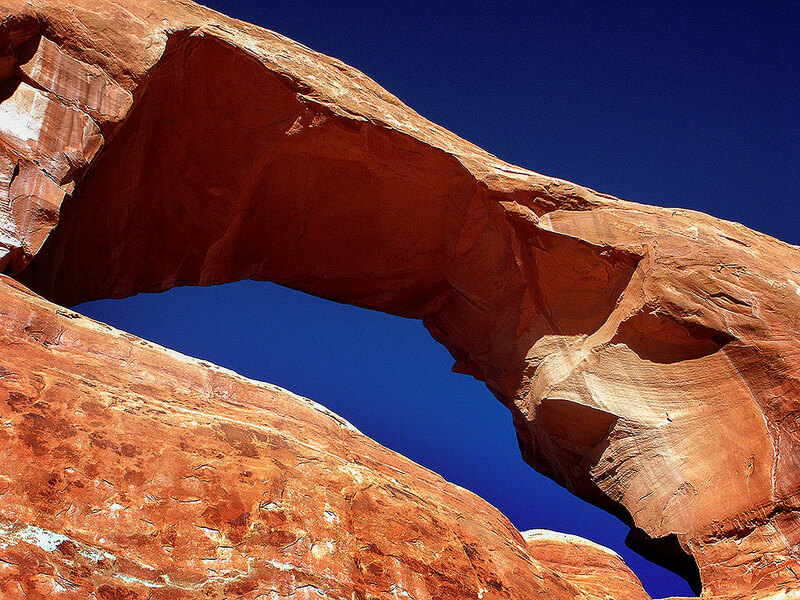 Skyline Arch is set against a deep blue sky at Arches National Park. 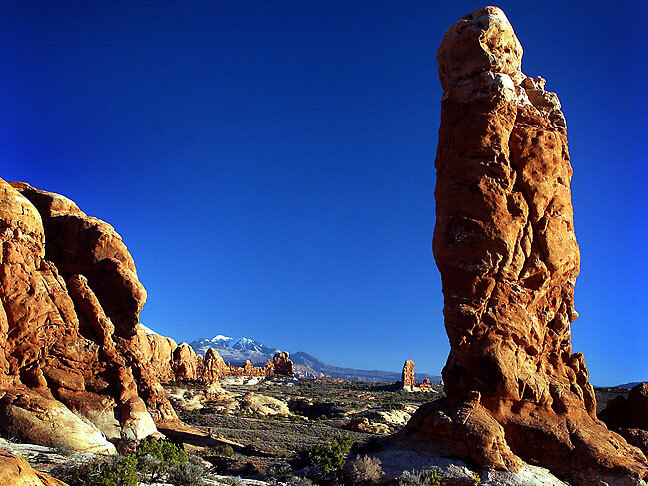 This view shows sndstone pinnacle near Skyline Arch in Arches National Park. Pinnacles in the Garden of Eden section of Arches are set against a perfectly blue sky. 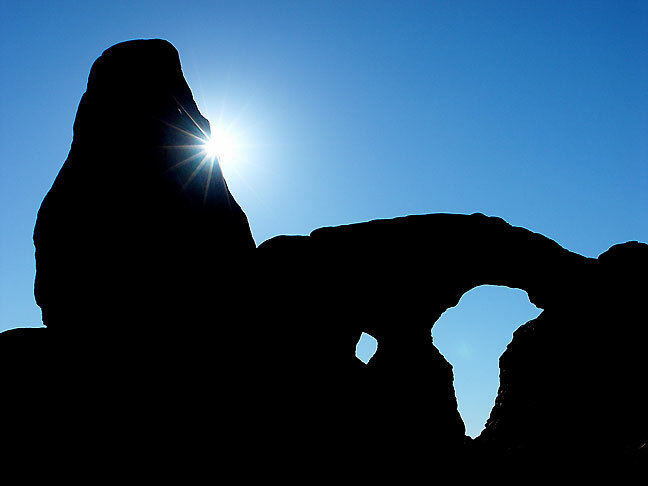 Turret Arch is silhouetted against the setting sun in the Windows section of Arches National Park. 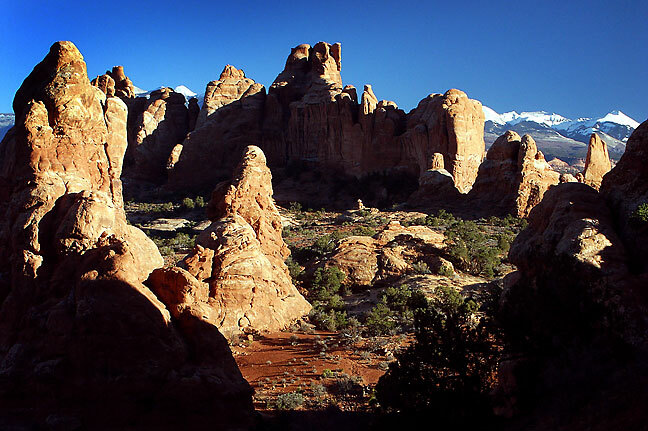 This overview looks south from the Windows section of Arches toward the La Sal Mountains. 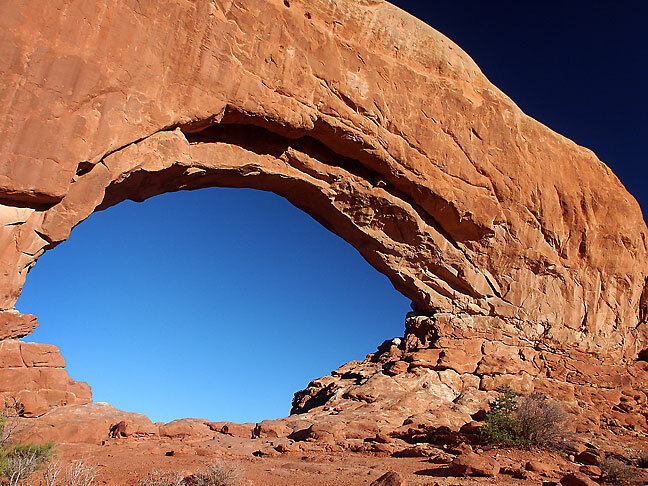 This is the North Window in the Windows section of Arches National Park. 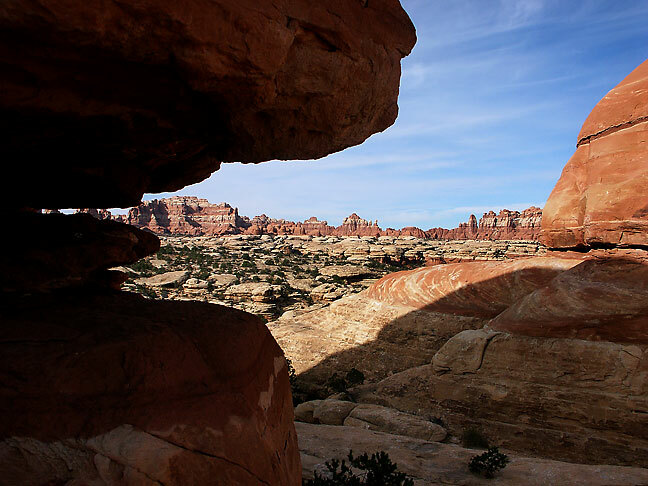 This is a contemplative view looking north from the opening of the North Window at Arches. 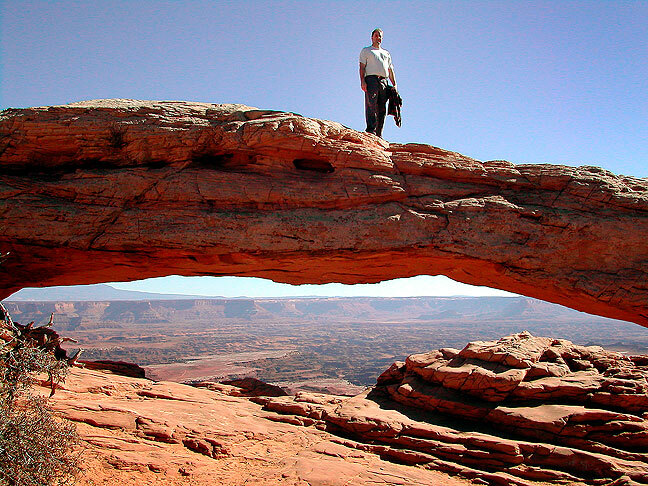 David strolls across Mesa Arch in the Island in the Sky district at Canyonlands. Jamie dreamed a bear lived in a tree outside her house, and kept calling her on his cell phone to try to coax her up into the tree. Our first stop was Dead Horse Point. 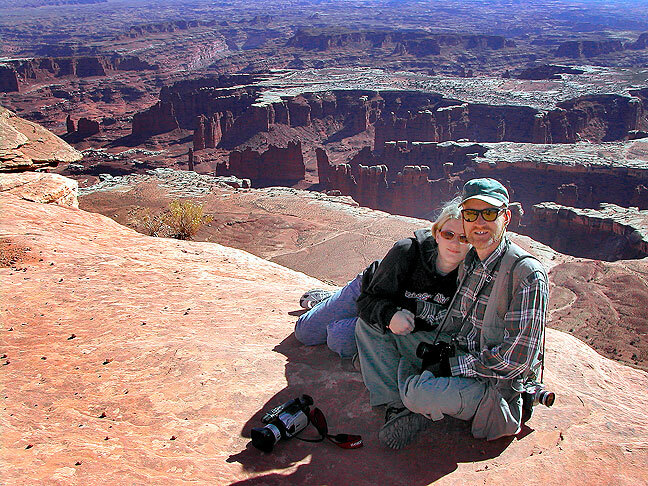 Jamie and I stand on a precipice at Dead Horse Point. 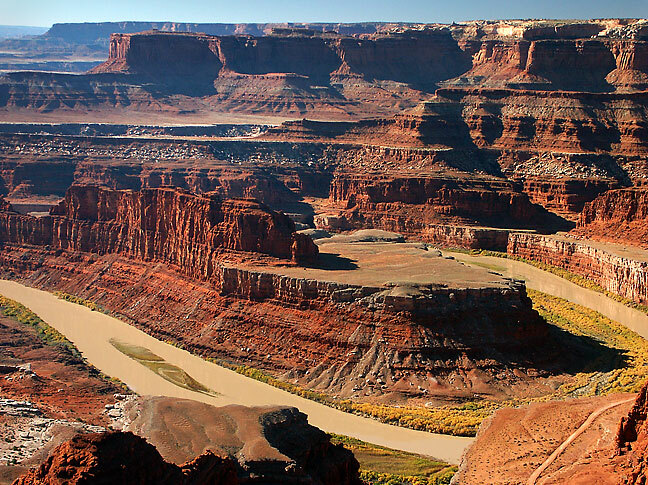 This view is from Dead Horse Point State Park overlook, looking southwest toward the Island in the Sky district of Canyonlands National Park. 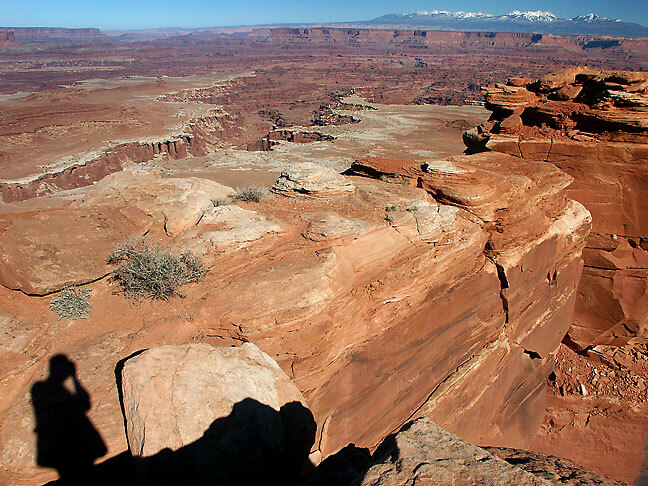 This wider view from Dead Horse Point shows the panoramic potential of the vista. 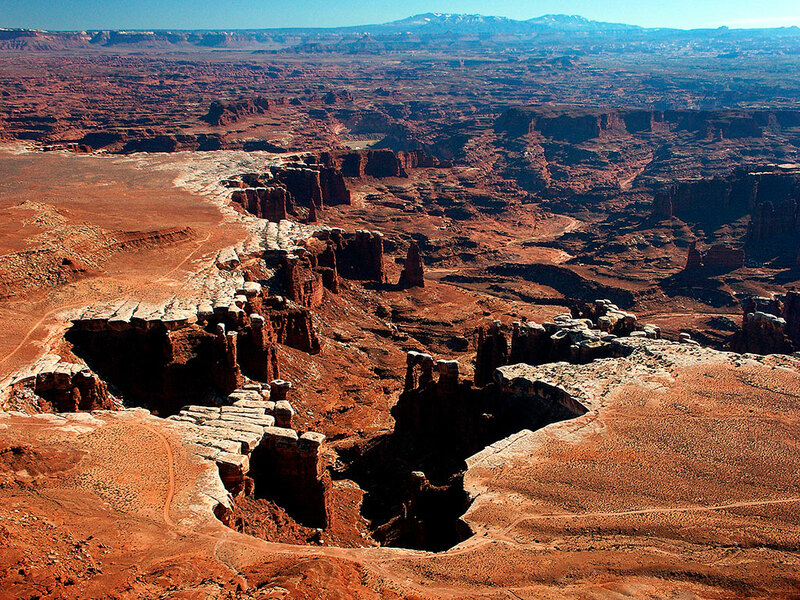 Beyond the river is the Island in the Sky district at Canyonlands. Jamie and I pose at the edge of a cliff at Canyonland’s Island in the Sky district. 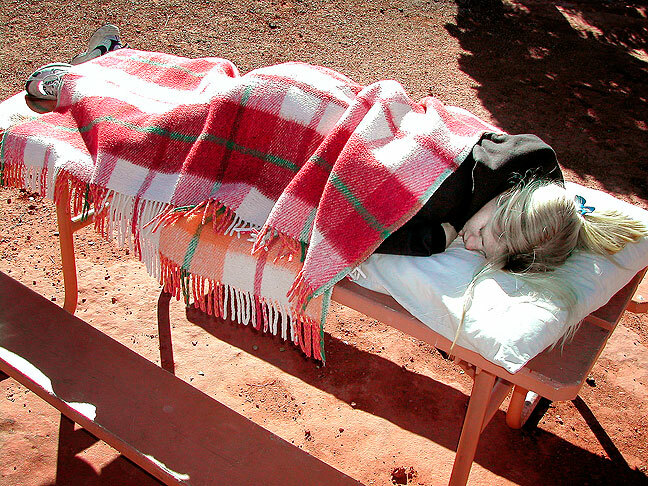 Another nap; Jamie sleeps on a picnic table while David and I explore the White Rim Overlook at Canyonlands. 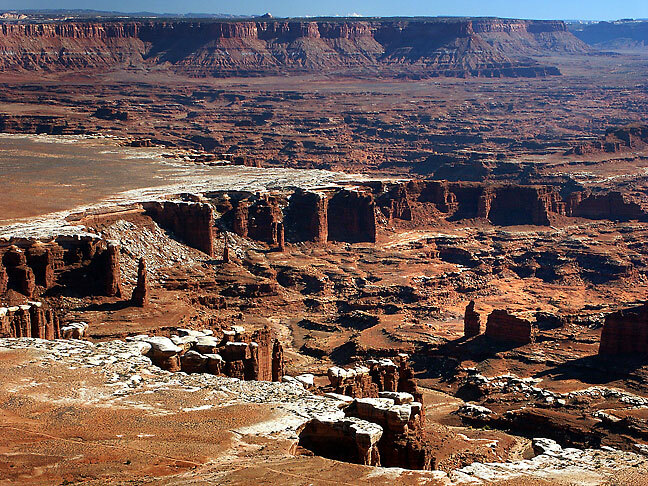 Our next stop for the day was the Island in the Sky district of Canyonlands. We visited Grand View Point, followed by David and me hiking the one mile long White Rim Overlook trail, while Jamie napped on a picnic table. 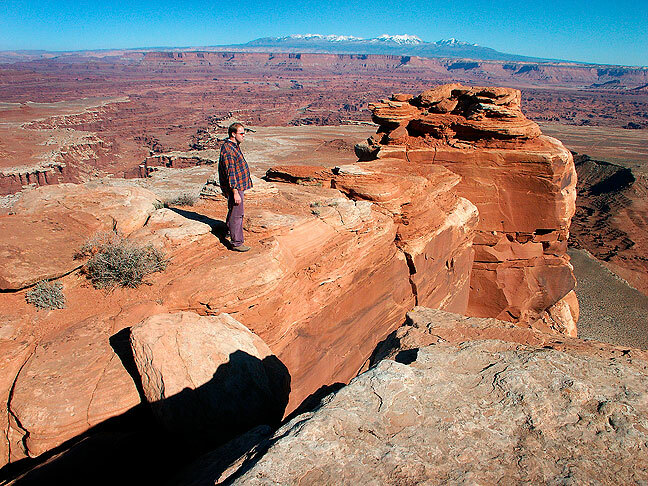 David hikes around at the end of the excellent White Rim Overlook trail at Canyonland’s Island in the Sky District. 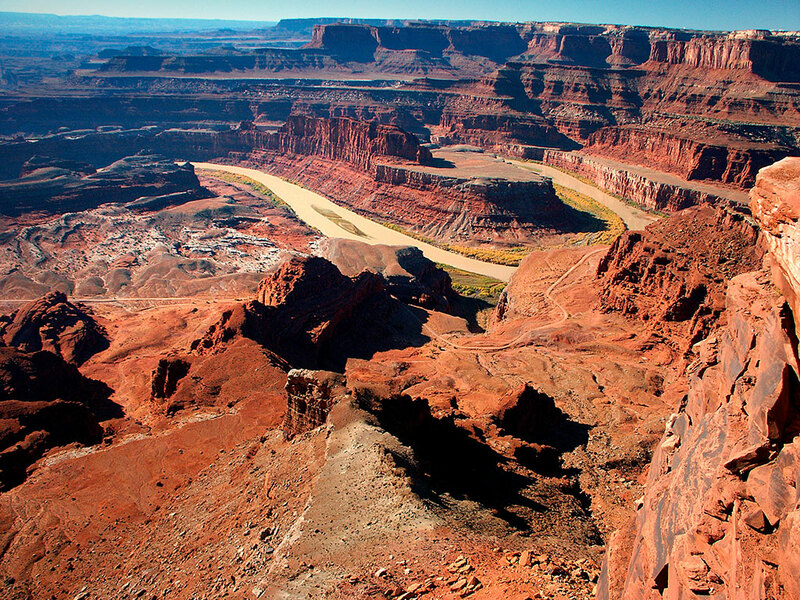 Monument Basin is visible from the White Rim Overlook at Island in the Sky district, with Hatch Point in the distance. 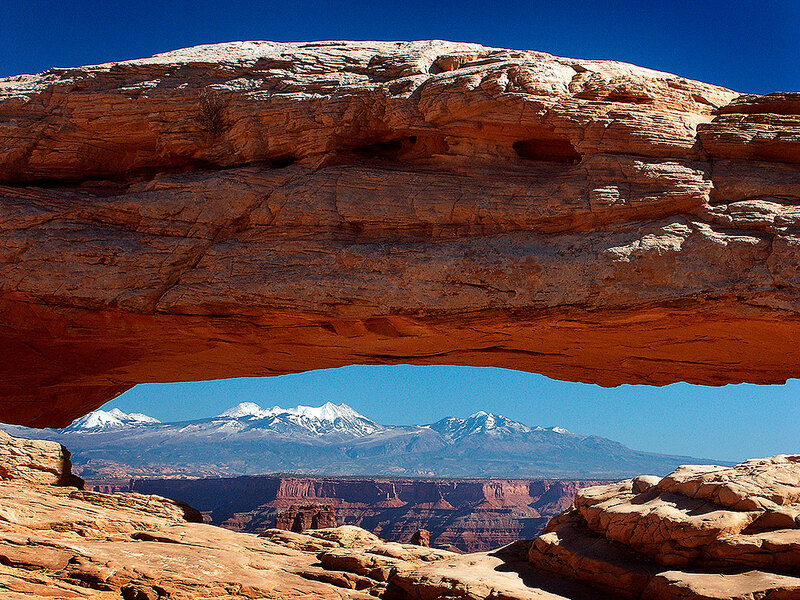 The majestic La Sal Mountains are visible through Mesa Arch at the Island in the Sky district of Canyonlands. 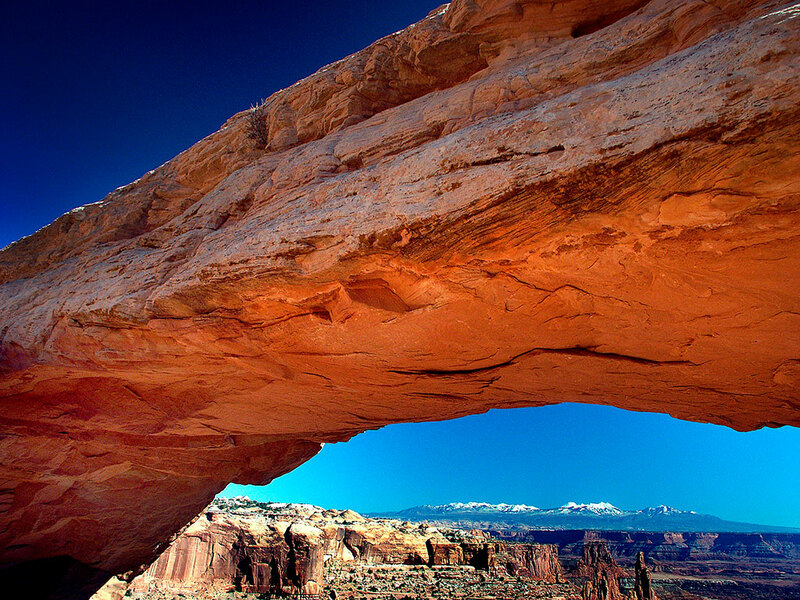 This is another perspective on Mesa Arch at Canyonlands. This image shows Monument Basin from the White Rim Overlook with the Abajo Mountains in the distance. 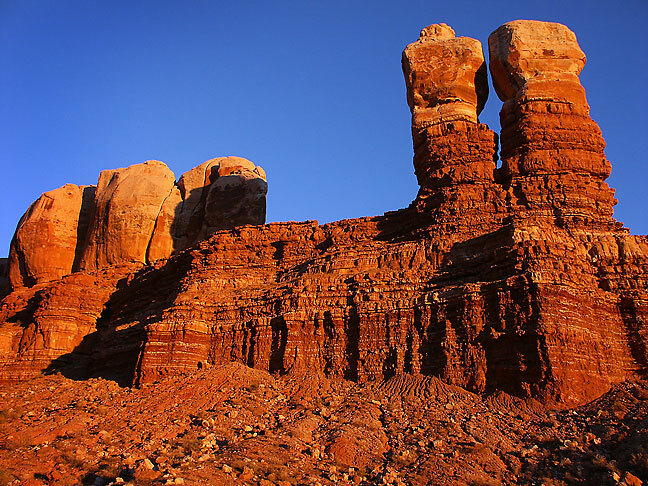 The White Rim Overlook trail is one of the best, since it allows anyone who can walk a mile to view some of the best scenery in the American West. 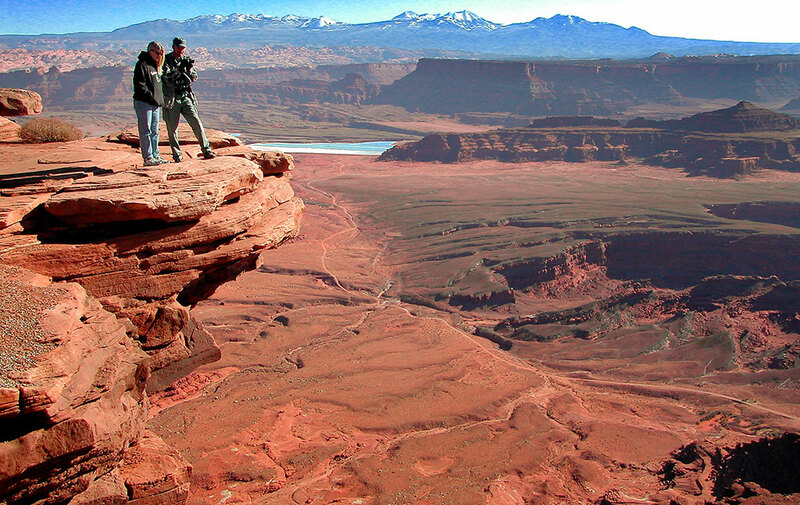 This view looks east from the White Rim Overlook, with the La Sal Mountains in the distance. 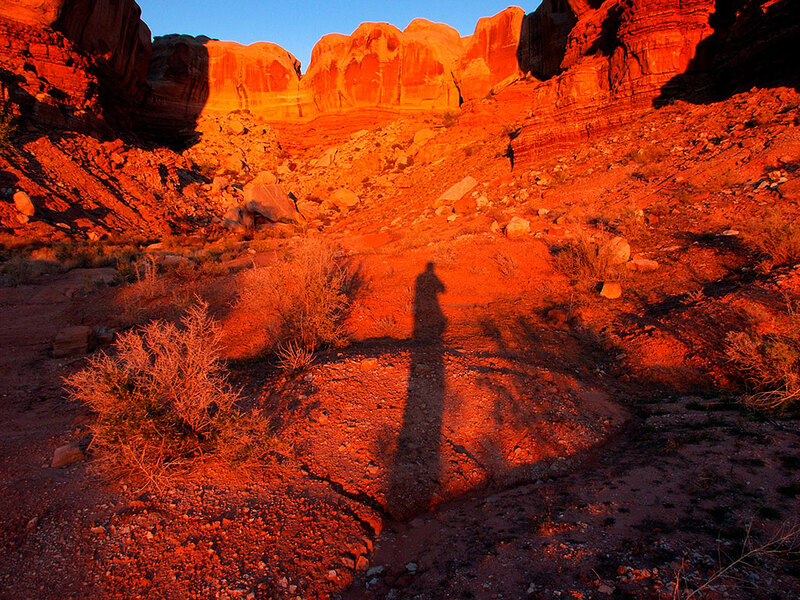 I made this shadow self-portrait at Navajo Twin Rocks near Bluff, Utah. We drove south from Moab, stopping for dinner at Navajo Twin Rocks in Bluff. We continued into the night and finally stopped for the night in Grants, New Mexico. 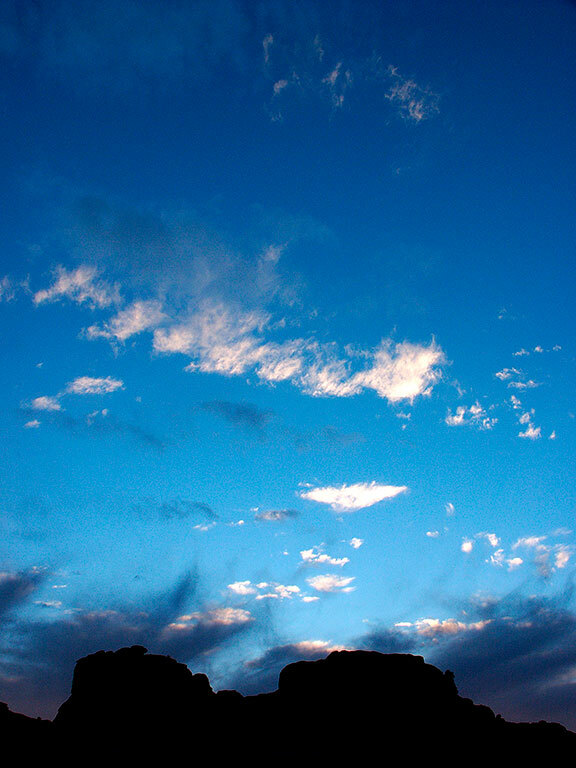 Near the end of our trip, we stopped for dinner in Bluff, Utah, where I photographed the Navajo Twin Rocks at sunset.